Imagine if, on an ordinary day, after a morning of studying tadpoles and drawing birds at school, war came to your town and turned it to rubble. Imagine if you lost everything and everyone, and you had to make a dangerous journey all alone. Imagine that there was no welcome at the end, and no room for you to even take a seat at school. And then a child, just like you, gave you something ordinary but so very, very precious. 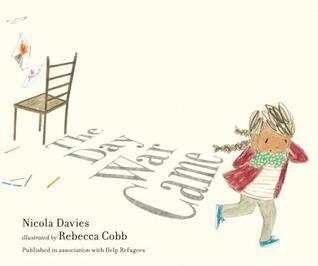 In lyrical, deeply affecting language, Nicola Davies's text combines with Rebecca Cobb's expressive illustrations to evoke the experience of a child who sees war take away all that she knows. This book arrived the day I left for college in September, so it's taken me a while to get back and get around to reviewing it. My parents and sister did read it, though, and they reported over FaceTime that they found it actually kind of hilarious–hilariously depressing, that is. My sister actually read the whole book to me while I was in the airport, half laughing at it the whole time. It's not that my family takes pleasure from the pain of children, or that my sister actually thinks the book was meant to be a humorous one. The Day War Came is a very sad story about a girl whose entire world is destroyed, and who struggles to find a place to belong because people don't care about immigrants. Davies is very much making a statement with this book, and she tells a gritty, depressing story to make that statement. And I think that's what my sister–and I–find so ridiculous about this book: it's a picture book. It's written for kids who barely know how to read. Each page has just a few lines for a child to potentially struggle through on their own. And yet the story it tells is not really age-appropriate for children that small, nor is the tone one that they would enjoy. I can very easily see this book (supported by Help Refugees) traumatising children in its target audience, and for what? Toddlers have absolutely no control over immigration, and stories like this are only going to upset them (or, at best, bore them). And the political agenda is so blatant that it's definitely not going to convince anyone to change their stance on immigration. I suppose the best to hope for is that it might soften the parent's behavior toward an immigrant child they might meet someday? I can't say the words that tell you / about the blackened hole / that had been my home. All I can say is this: / War took everything. / War took everyone. / I was ragged, bloody, all alone. I surely can't be the only one, politics aside, who has no interest in reading this to any child, ever.